PHILADELPHIA (CNS) — Among the pilgrims gathered for Pope Francis’ Mass on Benjamin Franklin Parkway Sept. 27 was Nga Bich Tham, who was wearing a traditional hat of her native Vietnam. “I designed it myself,” she said. Tham, 56, fled Vietnam in 1975. She made her way to Boston and made a living as a chemical engineer taking time to raise her newborn son. After seven years, she went back to school to get her master’s degree in education and taught at Catholics schools in the Boston Archdiocese. She works part time now translating educational documents for autistic children. “I’m happier that way,” she said. Tham worships at a Vietnamese community at St. Patrick Parish in Lowell, Massachusetts. Vietnamese Catholics from Lowell as well as Manchester, New Hampshire, and Toronto — 150 in all — left at 1 a.m. (EDT) Sept. 26 to be part of a 5,000 strong Vietnamese Catholic contingent in Philadelphia. “I was so inspired by Pope Francis. I can see Jesus in him. The way he loves the poor. He’s very humble. … He really trusts in the love of Jesus. Then he tries to prove the love of Jesus through actions, not just words,” Tham said. 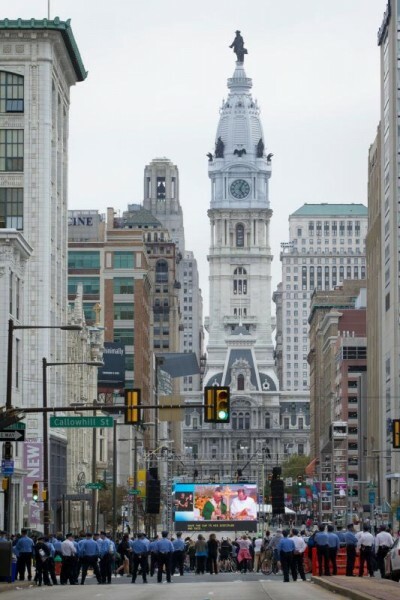 Some people came to Philly in a roundabout way. Megan Nicol, a sophomore at Lumen Christi High School in Jackson, Michigan, traveled with her father to Columbus, Ohio, to meet Megan’s aunt, Kathy Nicol. From there, the trio drove to Lexington, Kentucky, to meet Kathy’s mother and Megan’s grandmother. It was from Lexington that they joined a 130-passenger bus caravan to Philadelphia, which took 15 hours. Kathy Nicol and other Lexington pilgrims went to the National Shrine of St. John Neumann and caught a glimpse of a display of miraculous medals. 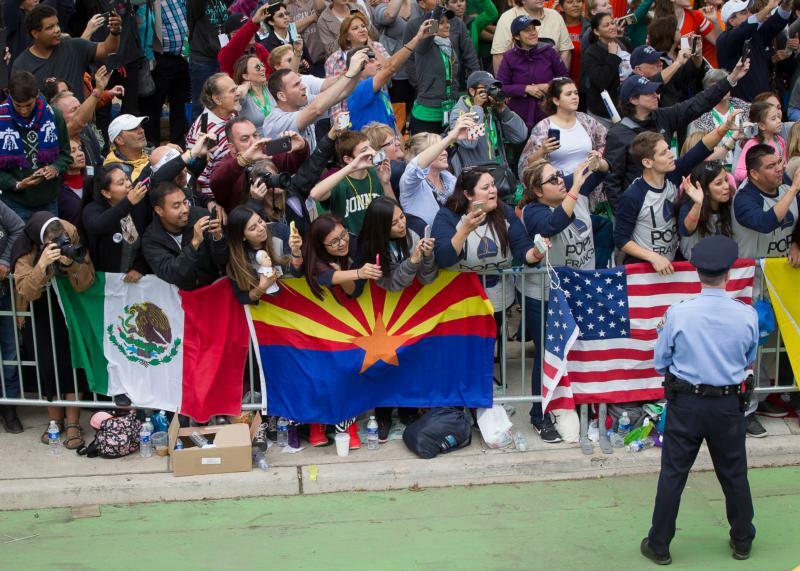 Later, Kathy and Megan got close enough to the barricades at the Sept. 26 Festival of Families to see Pope Francis. “We got a six-seconds of video of him waving,” Megan said. Ken and Maria Brice of Hillsborough, New Jersey, could have tried to see the pope in New York about an hour from their home, but “I heard only recently he was going to be in New York,” Ken said. “New York is crazy, a little bit. Nothing bad crazy,” Maria added. The Brices left at 5:30 a.m. to be part of a five-bus squadron the morning of the parkway Mass. The entourage of 90 people included students from a Catholic school near their home. “We don’t know where they are,” Ken Brice said, adding that he knew where they are supposed to meet the buses following the Mass. “I always heard about ‘el Papa’ (the pope),” Maria Brice said. “She got very excited when she heard he was coming to town,” Ken Brice said. Three generations of a clan from Greenville, Ohio, made an overnight bus trip for the chance to see Pope Francis on the parkway. Elizabeth Jennings, came with her husband and three children and brought along her mother, Carol Henry, and her 11-year-old niece, Faith Henry. Jennings said they canceled travel and hotel plans for themselves to be part of an Archdiocese of Cincinnati delegation departing from Dayton, Ohio. One of the perks of the trip was a scarf that says Archdiocese of Cincinnati given to each passenger. While the scarf was a nice touch, the bus ride itself was not. “It was cramped. They brought three buses and all three were full,” Jennings said. “It was like sitting in an egg carton, and we were the eggs,” Carol Henry said. Dilania Inoa, 38, a member of Assumption Parish in Providence, Rhode Island, was part of more than 400 pilgrims hailing from the statewide diocese. “I’ve always wanted to meet the pope,” said Inoa, who was born in the Dominican Republic and came to Providence with her family at age 12. “I think I’ve felt this way ever since I heard about (St. John Paul II) when I was young. “In my lifetime, I may never have the opportunity again. I’ve never had the opportunity to go the Vatican. The opportunity has come to us,” she said. However, Inoa was the only one from her family able to make the journey to Philadelphia. She recalled hearing form her grandmother when St. John Paul visited the Dominican Republic and her grandmother traversed the hills in order to see him. Inoa said that in essence she was doing the same thing. Two winners of “pope passes” from the Southeastern Pennsylvania Transportation Authority, or SEPTA, carved out space near a Jumbotron television screen on the parkway. “I won both Saturday and Sunday” passes,” said Janine Jagloski of Reading, Pennsylvania. She opted not to claim the Saturday pass though. Zink claimed her prize in August. “I’m not going to miss this,” she declared. She chose to use her SEPTA pass prizes because she had heard no word about any transportation having been arranged by her parish, Holy Cross in Dover. “Then, two or three weeks ago, the church said, ‘For those of you going on the bus … ,’ but I already had my ticket,” Zink said.